Will this impact my company's HotelTechScore and ranking? Can past reviewers update the reviews to make them current? How do I know if my company has Share of Voice? What is the Share of Voice variable? The easiest way to think about the new Share of Voice variable is by asking the question, "which products in a given category are being talked about most by hoteliers on Hotel Tech Report'." Why is Share of Voice important? Imagine a company that has 50 hotel customers that love their product and left a review a year ago but none since vs a company that had 10 reviews last year and 40 new ones this year. The company that had 40 new satisfied and engaged clients indicates that they are growing quickly and this is a signal of quality for buyers to help them avoid stagnating companies or companies who's customer sentiment is slipping over time. Most vendors with engaged customers who have received verified reviews within the past 90-days will not see a change in their score. However, if you are a vendor who has old reviews and stale content on your profile, you may see your score decrease. Yes. Hoteliers can simply write another review and it will update and replace their old review (see: How Hoteliers Can Update a Review). The goal is to ensure that your company has fresh reviews each quarter similar to other companies in your category order to increase your Share of Voice. 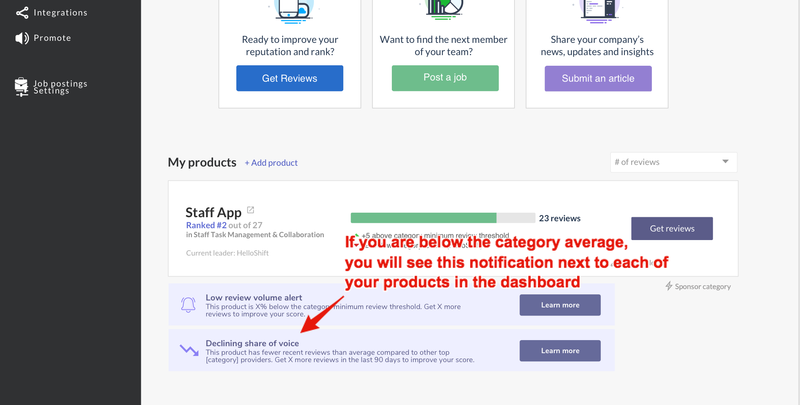 To find out your company's relative share of voice in your category, head to your dashboard to find out. Want to improve your HotelTechScore and Ranking? Reach out anytime via the 24/7 on-site live chat to speak with an HTR representative.